Changsha is an important commercial city in south central China. It is located south of the of the Yangtze (Changjiang) River and Lake Dongting, the second largest freshwater lake in China. Changsha's population greatly increases over time. Under the Qing dynasty, Changsha, a major rice market, becomes the capital of Hunan Province. The province's east, south and west sides are surrounded by mountains and hills. During the Taiping Rebellion against the ruling Qing Dynasty, Changsha is besieged, but never falls. 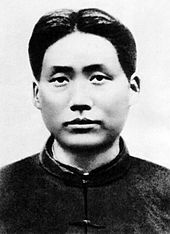 Hunanese native Mao Tse-Tung (Zedong) converts to communism in Changsha. Japanese troops enter northern Hunan, Province. Yueyang falls. Soon, Chinese and Japanese armies face off along the Xinqiang River just outside of Changsha. Generalissimo Chiang Kai-shek lacks confidence in his army’s ability to hold Changsha, so he decides to burn the entire city to the ground so the Japanese will gain nothing in its taking. Arson teams are organized and dispatched throughout the city. They are ordered to set the fires once a signal fire is set off on the top of the Tianxin Building in southwest Changsha. At about 0200, there is a fire in a military hospital just outside of the South Gate. The arson teams take it as a signal and start to set the fires. The fires burn for five days. The Changsha Fire, also known as Wenxi Fire, becomes the greatest human-caused city-wide fire that ever besieges China. More than 3,000 people lose their lives and over 56,000 (90%) of the city’s buildings are burned. The fire costs 1 billion dollars. The Japanese plan to use 180,000 men to capture Changsha by 30 September. Their forces include the IJA’s 3rd, 6th, 13th, 33rd, 101st divisions, supported by over 300 IJN warships of all sizes and part of the Shanghai Special Naval Landing Force (SNLF). The IJA plan calls for half of their force to attack Changsha directly from the south and the remaining half to move to the west to trap the fleeing defenders. That morning, the Japanese launch an attack against Chinese positions on Mt. Dayunshan. The IJA 11th Army's commander, Gen Okamura Yasuji moves his command center to Xianning. During the night, LtGen Nakai Ryotaro’s 106th Division attacks westward from north of Fengxin against the 184th Division of the Chinese 60th Corps. At the same time, LtGen Amakasu Shigetaro's 33rd Division assaults the Chinese 15th Army Group in the south. LtGen Saito Masatoshi’s 101st Division from Dacheng attacks Mt Lianhuashan and the Gaoan area. After capturing Gaoan, the bulk of the Japanese forces move northwest to attack Sandu and Xiushui. Gen Okamura's 100,000 man strong 11th Army launches an offensive against Changsha consisting of LtGen Fujita Shinichi’s 3rd Division, LtGen Inaba Shiro’s 6th Division, Gen Tanaka Shizuichi’s 13th Division, LtGen Amakasu's 33rd Division, LtGen Saito’s 101st Division and LtGen Nakai’s 106th Division. The IJA 3rd, 5th, 6th, 13th and 33rd Divisions also attack Chinese positions in the northern Hunan area. The IJN’s China Area Fleet's 11th Battle Squadron, 13th Gunboat Unit, a detachment of the Shanghai SNLF and 4th Guard Unit support Okamura’s forces. "Scores of ships and more than a 100 motor boats" are involved in an opposed landing at the mouth of the Mi-lo River on the Hsiang River. They land the IJN's Shanghai SNLF and elements of the LtGen Inaba’s 3rd Division. 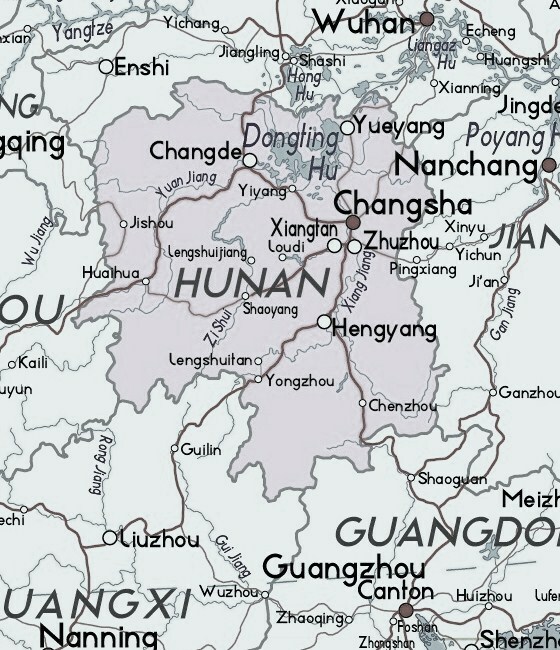 Jiangxi Province, E of Hunan. Chinese forces outnumber the IJA by nearly two-to-one. They launch a counter offensive that quickly stops the Japanese. Sinchiang River. The Japanese launch an attack against the Chinese defensive positions using poison gas. 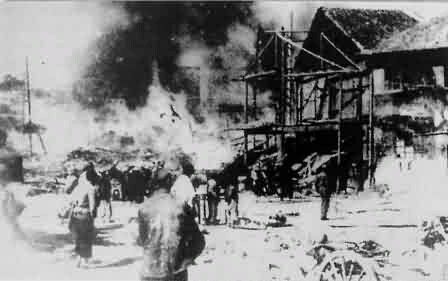 That same day, Chinese forces recapture Cunqianjie. After Japanese forces move out of Gaoan, Chinese forces recapture the city. Flood waters from the Yangtze flow into Dongting Lake. 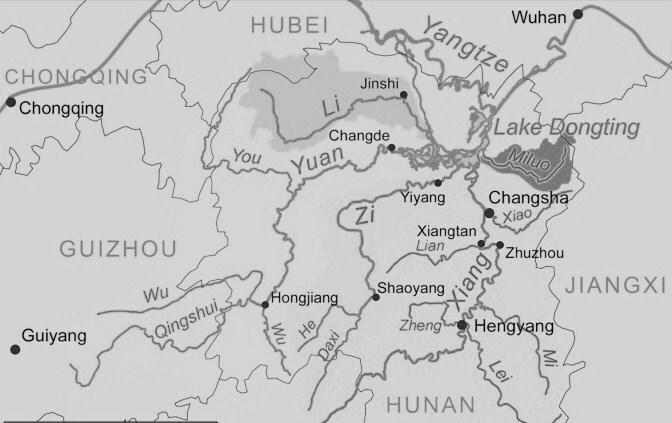 The lake is also fed by the Xiang, Zi ,Yuan and Li rivers. Smaller rivers such as the Miluo River also flow in. The Xiao River flows into the Xiang before the Xiang flows into Dongting Lake. Ocean-going vessels can travel through the Xiang to reach Changsha. At dawn, the IJA 6th Division crosses the Xinqianghe River under heavy arillery cover. At about 0620, another IJA division lands at Yingtian, near the Xinqianghe and Miluojiang river mouths under the cover of IJN warships and aircraft. The IJN's Shanghai SNLF and IJA 3rd division, with support of naval gunfire, land in the East. 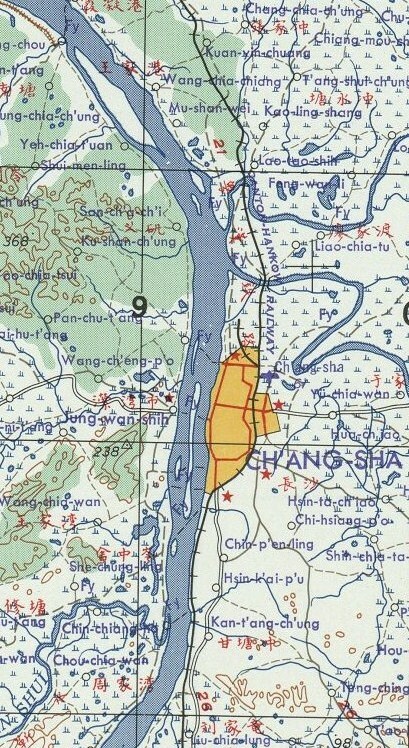 Changsha is surrounded on three sides. The Chinese abandon their positions. The most successful cooperation of the war then follows between Chinese regular forces and Communist guerrillas. The Chinese blow up all bridges, mine all major road junctions and hold the Japanese advance. Chinese troops form small groups and, with the help of the Communists, attack IJA supply convoys, arms depots and communication lines. Japanese troops reach the outskirts of Changsha, but have been weakened by heavy casualties of about 40,000 men including many KIA. The Japanese begin to retreat after suffering heavy losses and dwindling supplies. The IJA 6th Division, pulls back from the outskirts of Changsha across the Laodaohe River with the Chinese in pursuit. The Chinese order a general counter-attack against the Japanese to the south of Yueyang and Chongyang. Chinese troops chase the Japanese to Jinjing and Fulinpu. That same day, Chinese planes bomb the Japanese airfield at Wuhan. Chinese troops recover Miluo and Xinshi. Chinese forces shoot down a Japanese plane and find Gen Okamura’s order to retreat. Near Yingtian, at the Dongtinghu lakeshore, the Chinese 23rd Division of the 54th Corps attacks Japanese warships. The remnants of the Japanese forces flee north in the first major defeat of the Japanese Army at a major Chinese city since the start of the Second Sino-Japanese War. The battle marks the end of the Japanese advance in central China for the remainder of the war. The Japanese fall back to the northern bank of Miluojiang River. 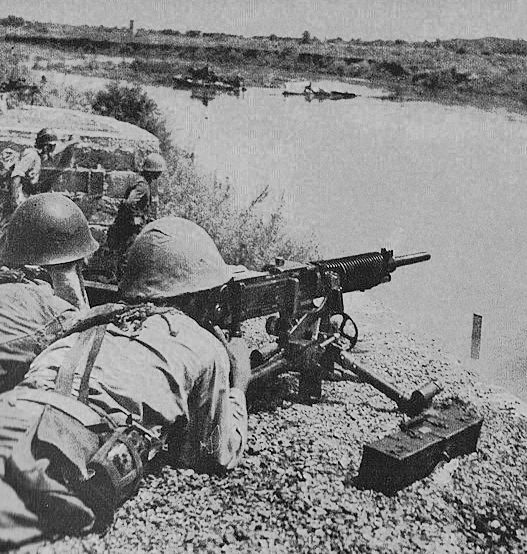 The Chinese 195th Division of the 52nd Corps pursue them across the Xinqianghe River and recapture their former forward positions. The Chinese also launch nightly raids into Xitang and Yaolin. All lost territories in northern Hunan Province, southern Hubei Province and northern Jiangxi Province are recaptured. In Sep ’41, two years after the First Battle of Changsha, the Imperial Japanese Army returned with over 120,000 troops in a second attempt to take Changsha and on 28 Sep, the Second Battle of Changsha began. Within a few days, ten reinforced Chinese regular armies retake Changsha. The IJA suffers 10,000 casualties. 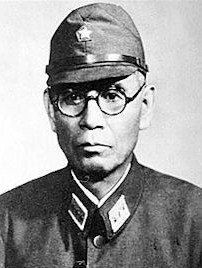 Gen (later War Minister and Japan's highest ranking general Anami Korechika), Commander, 11th Army ordered a general retreat and the Chinese declared victory. By 8 Oct’ 41, the Second Battle of Changsha ended with no change in territories. In Dec '41, following the attack at Pearl Harbor, the IJA again returned and the Third Battle of Changsha began. In the end, almost 57,000 Japanese troops were lost around the heavily defended city. Changsha refused to fall. The Battles of Changsha were important major victories during a time when Japan was otherwise triumphant throughout the Pacific.